6-2-16: 19 months old... man we are headed for TWO at lightening speed sweet boy! You have the best manors of any kid I have met and that tickles me to no need! You say please, thank you, yes and no mam and sir and you say bless you anytime you hear someone sneeze. Last week you decided all on your own that you wanted to go tee tee on the potty and you have done great! We bought you some Thomas the Train pull-ups and you are doing so good! Yesterday you only had 2 accidents. It just amazes me that you wanted to do this at such a young age! As much as I want to keep you little.....the thought of being out of diapers just TICKLES me to death!!! Creed look at mommy.......you are such a stinker you intentionally don't look but you always crack a smile when I say....I know you hear me! But of course mommy keeps trying for "just a few more pictures!" Two weeks ago you went to your very first VBS! Last year you where so tiny I carried you around but this year that was not an option,lol! You where the only kid you age so you had me and Ms. Patti all to yourself! And Mr. Randy gave you your very first Oreo.....and you where smitten with it! You got to go to snack time with the 3-4 years olds and you thought you where big stuff! Blue tounge, mouth, hands, chin, and even blue hair by the time you where done! Monday and Tuesday you gave VBS your all but by Wednesday you didn't even make it 5 minutes and you where out for 2 1/2 hours! It was nice to just lay by you and watch you sleep! And we also recently celebrated Daddy's birthday....you now love to sing happy birthday and try super hard to blow those candles out! you where in heaven! You and cake are two peas in a pod! You are such a boy and it's so different after having 2 girls. You love dirt, rocks, bugs, and you get sweaty and down right stinky and I LOVE IT! You are our constant source of entertainment these days! You NEVER sit still and you are NEVER quite! YIKES it's almost July and here I am just getting to your JUNE post....oops! Your 9th birthday is just around the corner and you could not be more excited! You have some many ideas and plans for your party even you get confused on what you really want. A week from today you leave for your first over night church camp.....you will be gone for THREE nights and FOUR long days. This mommy is really not ready to turn you lose. I hope you have a blast but dang it, I am dreading it big time! You summer is full of swimming and gymnastics and you wouldnt have it any other way! Last Friday we had our yearly peanut allergy testing and good gravy it went bad fast! I knew by the way you where acting it was not gonna be good; the nurse came in and was shocked at how you reacted and called for the doctor who said you where wheezing and stopped the test immediately! She said there was no reason to continue with the test and advised me not test again for 2 years due to severeness of the reaction. I hate it for you sweet girl, I know you want to eat a Butterfinger for the life of you! But in the grand scheme of life, it's not that big of a deal; you are overly blessed! So after the bad reaction you and I shopped, ate Chinese food and got a marvelous pedicure! IT was such a fun Mommy and MC only day! Two weeks ago we had VBS and you had a blast! This was the first year you did not ask me to be your crew leader and you didn't even come looking for me just to get a hug. YAY and BOO! Im proud of you but I sure did miss seeing your sweet face pop and say I just wanted to hug ya! You are having a blast this summer helping our babysitter with Creed and Paisley! She says your like a mini mommy! Which I already knew .....your my best helper ever sweet girl! 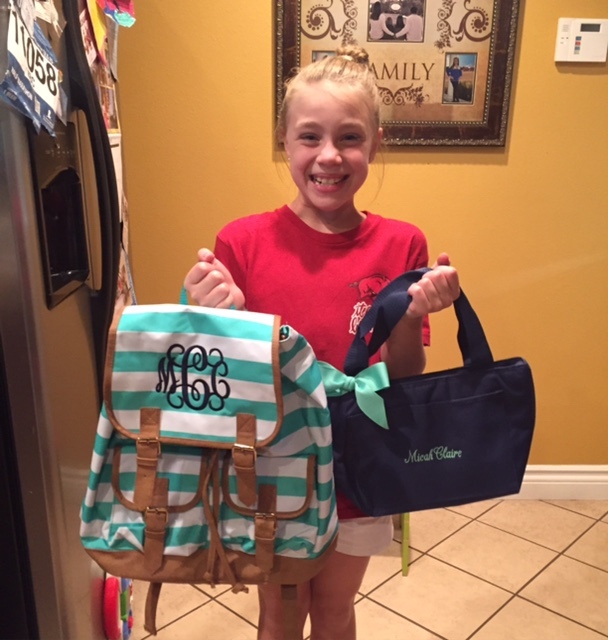 and yesterday we came home to a GREAT surprise... you 3rd grade back pack and lunch box! I mean you smile says it all! We love this beach and all this town has to offer! This year we had such blast on and off the beach! I LOVE the view from our balcony....there is nothing like being right on the beach! I could wake up to this view everyday of my life! The girls are beach ready!!! Little mans first official steps on the beach! And they are all in the ocean! Oh this smile made the 10 hour drive soooo worth it! The TRACK has become one of our most favorite places to spend time! I think Poppa Mike had more fun than anyone! He and daddy rode race cars all night long! and MC was FINALLY tall enough to drive her own car allllll alone! It was the MOST hilarious thing I have ever witnessed in my life! When she got done she said her arms where sore from holding the steering wheel so tight and she peed in her pants......BAHAHAHAH! Tuseday morning we made a long walk to the parasailing booth! GROUP picture! At the last minute daddy and mimi decided to join in on the fun and I am sooo glad they did. They both had a BLAST! loading up to head up on the banana to ride out to the boat! and up up up we went......450 feet in the air and it was marvelous! I was scare the girls where going to freak out but the absolutely loved every second of it! LOVE this smile and all the giggles that came with it! And this year KB was just a teeny tiny hair to short to do the big ropes course but they did have a new ropes course for little ones and she loved it! Can't wait till next year when she can do the big one with me and MC! oops....my hair kind took over daddy's face,lol! The captian kept calling him shark bait and he cracked up every time he heard the captain say it! TACKY JACKS!!! Best food ever!!!! and 2014 tag but our 2015 tag was gone.....oh the girls where so bummed! but we got our 2016 one up and hopefully it will still be there next year! And Creed just LOVED shopping at the outlets.....cant ya tell! And mimi and the girls made cookies one night and guess who LOVED them!!! My chocolate loving boy......that is who!